Imperial Stormtroopers get teased a lot for being such notoriously bad shots, but can you really blame them? They are the backbone of the Emperor’s military might, but are wearing big clunky buckets on their heads. And who can be expected to aim an E-11 blaster rifle if they can't even see where it's pointed? It sounds like the Empire should invest in some higher quality headgear for its troopers, like this Collector's Stormtrooper Helmet! Okay, we might be exaggerating a bit, since an actual elite space soldier will want something more hi-tech than a vinyl reproduction helmet protecting their noodle. 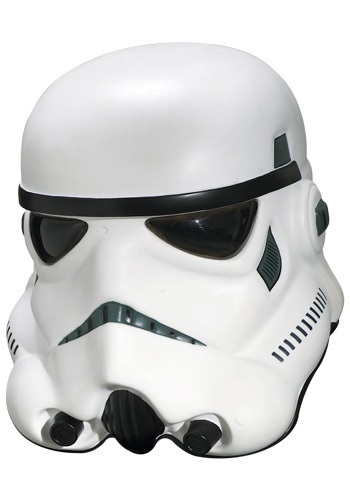 But if you're cosplaying as a stormtrooper, and aren’t about to go patrol the Outer Rim for some missing droids, this fantastically detailed helmet will do the trick! It recreates the look of those fearsome villains from the Star Wars saga, so it'll perfectly match the rest of your trooper outfit. And be sure to grab a toy blaster rifle, too, since it'll look awesome and you won't have to worry about trying to aim it anyway!